Drew Emborsky, the Crochet Dude. All entries were evaluated equally in a blind judging across a range of qualities including: design appeal, use of stitches, color, selection of materials, workmanship, finishing, appearance and functionality as indicated. We had more entries than ever this year, submitted by a number of very talented designers. Please check the CGOA blog (cgoanow.blogspot.com) within the next week or so for a link to a flickr pool so you can see photos of all the fabulous entries! Due to time constraints while at Chain Link, we are unable to post photos of winning entries today. We hope to get this done Friday or Saturday morning at the latest. We apologize for the delay, but we thought it important to let everyone know who all the winners are as quickly as possible! Fanciful Fashion (sponsored by Tulip Co, makers of exceptional tools including Etimo cushion grip crochet hooks and Carry T): fancy adult garments and accessories, including gowns, dresses and evening wear. Fashion (sponsored by Tahki Stacy Charles, bringing you fine yarn lines Tahki, S Charles, Filatura Di Crosa and Loop-d-Loop): for women or men, including sweaters, tops, jackets and skirts. Accessories (sponsored by WEBS, America’s Yarn Store): including shawls, socks, scarves, hats, bags, belts and jewelry. Small Wonders (sponsored by Boye and the Crochet Dude brand of crochet tools and accessories): anything small scale, including baby items, toys, amigurumi and small décor items. Afghans (sponsored by Caron International and BuyCaron.com): any and all afghans, throws, blankets and bed or sofa covers. Thread Crochet (sponsored by FaveCrafts/Prime Publishing, offering diverse crochet e-newsletters, e-books and patterns at FaveCrafts.com): anything made with crochet thread, including doilies, décor and accessories. Artistic Expressions (sponsored by Leisure Arts, bring you the art of everyday living): designs more artistic rather than functional in nature, including free-form and mixed media pieces, hangings, sculpture and wearable art. Would you like to help yarn bomb the New York Mets stadium on September 13? The New York City Crochet Guild will be working with Stitch and Pitch for the first yarn bombing of a major league baseball stadium. You're invited to submit a swatch in Mets colors (orange and blue). For more information, visit the Stitch and Pitch website: http://www.stitchandpitch.com for their contact information. Summer Chain Link Registration Now Open! Registration is now open for the summer Chain Link conference in Minneapolis from July 27-31. Come join us for classes, shopping, fashion shows, member meetings, special events, and so much more! CGOA on Getting Loopy Podcast! Amy Shelton, CGOA President, and Karen Whooley, CGOA Secretary, appeared on the March 14 episode of the Getting Loopy podcast with host Mary Beth Temple to talk about CGOA. Karen and I enjoyed talking with Mary Beth and sharing information about the benefits of being a CGOA member, our upcoming Chain Link conferences, and our Master of Advanced Stitches and Techniques program. CGOA donated a tote bag to the Getting Loopy weekly giveaway. Congratulations to our winner, Laura R. of West Allis, WI, who is interested in starting a CGOA chapter in her area. If you live near that area, please contact CGOA so we can forward your contact information to Laura. Be a part of this singular event celebrating the beauty and artistry of crochet, the only competition of its kind. Thanks to a bevy of magnificent sponsors we have thousands of dollars in cash prizes to award to our winning guild members for the best of the best in crochet design. With a huge grand prize plus first, second and third place prizes of $300, $200 and $100 respectively in each of seven judging categories plus special prizes, this promises to be the most rewarding event ever. Fancy adult garments and accessories, including gowns, dresses and evening wear. Garments for women or men, including sweaters, tops, jackets and skirts. Wearables including shawls, socks, scarves, hats, bags, belts and jewelry. Anything small scale, including baby items, toys, amigurimi and small décor items. Any and all afghans, throws, blankets and bed or sofa covers. Anything made with crochet thread, including doilies, décor and accessories. Artistic rather than functional in nature, including free-form and mixed media pieces, hangings, sculpture and wearable art. We are thrilled to welcome this year’s panel of judges: Marcy Smith, editor of Interweave Crochet magazine; Kathleen Sams, ambassador for Coats & Clark; and Drew Emborsky, the Crochet Dude. Judging will take place on location at the CGOA Conference in Greensboro, North Carolina, 21 September 2011 and winners will be announced during the Awards Ceremony on 22 September 2011. You do not have to be present to enter or to win but you will want to be there to marvel at the awesome display of entries and unveiling of the winning designs. Please use the links provided at www.crochet.org to download the complete Design Competition Information package and access the electronic entry form. Deadline for entries to be shipped to the receiving location is 31 August, 2011. Please do not submit a form until you ship your entry in August. Join us for an exciting crochet-along (CAL) here at CGOA Now! during March to celebrate National Crochet Month. How does it work? Pick a project to work on for the month or even just part of the month. Add a comment to this post and share information about your project: pattern (give a link if you can or tell us where it was published), yarn you’re using, why you chose to make this project, anything you want to share. Add photos to CGOA’s flickr photo pool. Then add links to your photos in your comment. Update us on your progress as often as you like by making new comments. Now I’m off to pick my National Crochet Month CAL project! 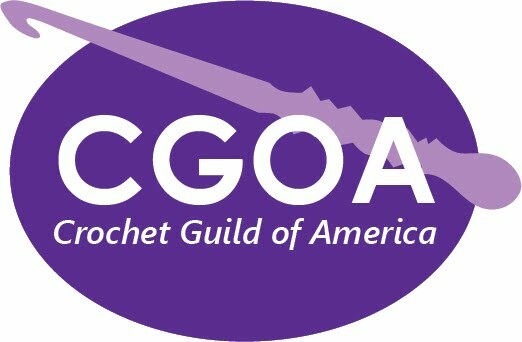 Help CGOA celebrate National Crochet Month! Did you know that March has been designated National Crochet Month? Your CGOA Board of Directors invites you to help us celebrate! We will be sponsoring a Crochet-Along in March (check this post [insert link] for all the details). If you joined CGOA or renewed your CGOA membership during or after our 2010 Chain Link Conference last year, you were given access to 'Across the Board Crochet', a pdf pattern booklet featuring patterns designed by the 2010 CGOA board members. Perhaps you’d like to work on one of these projects. Or perhaps there’s a pattern from Crochet! magazine (which you receive as one of your member benefits) that you’ve been anxious to try. Don’t forget all the other countless crochet patterns available in books, magazines, and on the internet. Let’s make National Crochet Month 2011 rock!